At first glance, Mike Novitsky already looks like a major Division I players. Already 6-foot-3 and 210 pounds, Novitsky is a big and aggressive position defender with strong skills and footspeed (he runs a 5.2 in the 40-yard dash, a good time for his size). But Novitsky, who attends Victor High School (NY), has four full seasons of varsity competition to go before he starts his collegiate career. 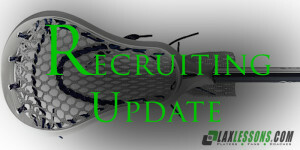 Last week, he decided where that will be, giving a verbal commitment to Virginia, a decision first reported when it was made by Joe Lombardi on LaxLessons.com’s Lacrosse Insider premium coverage section. The athletic Novitsky, who also plays football and basketball, is the third 2018 commit for Victor and also UVa’s third freshman tristate commit. Now, here’s a Q&A with Mike on his commitment. When I visited the campus, I was very comfortable talking to (UVa Head) Coach (Dom) Starsia and (Assistant) Coach (Marc) Van Arsdale. I felt that their coaching styles and coaching philosophies would be a good fit to further develop my lacrosse skills at the next level. I was impressed with the campus and athletic facilities. I also felt that I could be both challenged and successful academically and athletically at the University of Virginia. I considered University of North Carolina, Syracuse University, Penn State University, University of Michigan and Notre Dame. I visited University of North Carolina and Syracuse. My strengths as a player are one-on-one defense and being able to play on ball defense both left- and right-handed. My style of play is being aggressive and physical. I continue to work on my lateral quickness, stick skills, and my overall knowledge of defensive strategies. I started playing lacrosse in first grade on my Victor town team through the Rochester Area Lacrosse League. I also play varsity football and varsity basketball. I play on Sweetlax. Last summer I was on the Rochester 2018 team that participated in the 2014 Brine National Lacrosse Classic. I will be participating in the Maverik Showtime Lacrosse Showcase this summer and also I am on the Sweetlax 2018 national team that will be playing at the Lake Placid Summit Lacrosse Tournament in August. I want to thank my parents for their continued support and for taking me to all the tournaments and showcases. I want to thank my brother John for teaching me the basics of lacrosse and defense, and I want to thank my high school coaches, Bryan Lischerelli and Jim Andre for pushing me to keep getting better everyday. Finally, Sweetlax coach Kevin Martin for his support and effort throughout this recruiting process.